Grantmaking that hits close to home. Inspired by New York Life's tradition of service and humanity, the New York Life Foundation has, since its founding in 1979, provided more than $275 million in charitable contributions to national and local nonprofit organizations. The Foundation invests in programs that benefit young people, particularly in the areas of educational enhancement and childhood bereavement support. 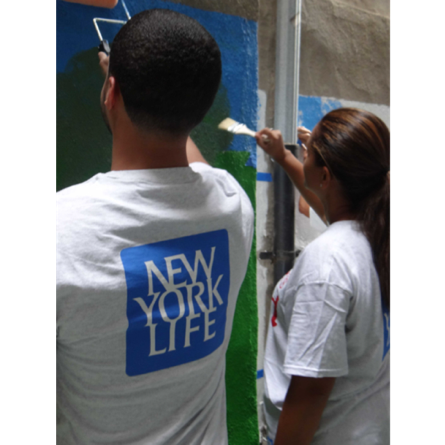 The Foundation also facilitates “people power,” encouraging the community involvement of employees and agents of New York Life who volunteer where and when it matters most. For nearly 175 years we’ve been entrusted to provide peace of mind through life’s transitions—our grant making efforts are an extension of our mission. Where we focus our funding. We are a leading resource for helping educators, families, communities and caregivers learn how to support children who have lost a parent or sibling. This focus aligns with our purpose, and who we are as a company. Our educational grantmaking programs focus on enrichment for middle schoolers during the critical out-of-school hours, in order to prepare them for their transition to high school and set them up for success. We provide Engagement Grants where and when there is a particular passion from our employees and agents towards a cause. We support, help facilitate, and recognize those who work locally to impact their communities. They put in the sweat; the Foundation puts in the equity. Most of our grantmaking is by invitation only. Our focus is on childhood grief support, of which we are the largest corporate contributor, and out-of-school-time programs for middle schoolers transitioning to high school. We accept applications through a Request for Proposal (RFP) grant process in our areas of strategic focus via The Grief Reach and Aim High programs. Our corporate signature program, Volunteers for Good, supports the philanthropic activities of our employees and agents. We offer several ways for our workforce to get involved: Individual Volunteer Grants, Team Grants, Community Impact Grants, GSSI Grants, Matching Gifts and a Giving Campaign. Supporting BELL Summer, a full-day immersive learning experience that combines academic instruction with fun hands-on enrichment activities. Funding for City Year’s after-school program, which provides middle school students with skill-building enrichment activities. Sponsoring the New York Life Excellence in Summer Learning awards and expanding their programs through our targeted grants. Supporting eLuna's Camp Erin National Bereavement Camps, as well as their National Bereavement Camp Conference and the National Bereavement Resource Guide. Helping Club members cope with loss, death and grief by fostering a culture of wellness through their “Be There” program. This grant also enables BGCA to build their Ready, Set, Action curriculum. Providing funding to help bereavement service providers use the power of stories and StoryCorps to help children cope with the death of a parent, sibling, or loved one. Employee donated time in 2018. It's time to magnify our focus on the "Magnificent Middle"
New York Life and Alliance for Strong Families and Communities announce grantees for new program. The Center for Complicated Grief at Columbia University’s School of Social Work has launched GriefSteps for Parents, an app designed to provide accessible, community-based support to families following the loss of a loved one.